Snack time is the one time of the day when a lot of people’s dreams of sticking to a diet seem to go out the window. Like everyone else, I have struggled in the past with finding a low calorie snack that is filling and that will actually leave me feeling satisfied. Unfortunately, many snacks just leave me wanting something else. Has that ever happen to you? 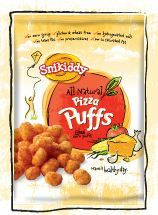 One product that I have found that is absolutely delicious and perfect for snacking is Snikkidy’s Pizza Puffs. You may remember that I posted on Snikkidy’s fries some time ago, and I do love those too, but there is something to be said about a snack that pays homage to the universal love of pizza. And from a psychological standpoint, when eating a puffed snack, our brains automatically think we’re eating more than we are, and that’s definitely a good thing! These great tasting puffy snacks are a great and healthy snack time alternative that features all natural ingredients, including real cheese. They are low in both saturated fat and cholesterol, and have thirty percent less fat than any other leading brand snack. They are free from gluten and wheat, and have no preservatives, trans-fats, or icky hydrogenated oils. Each serving provides one gram of dietary fiber and two grams of protein. At 110 calories per big one ounce serving and only 2 weight watchers points, how can I not say ‘yum’? Snikkidy Puffs are also available in other delicious sounding flavors, including Mac n’ Cheese Puffs, Nacho Cheese Puffs, and Grilled Cheese Puffs. The only thing better than delicious snacks with a pizza flavor is free, delicious snacks with a pizza flavor! PS. If you love pizza, check out my low calorie pizza recipe or my posting on low calorie pizza munchees. Oo anything pizza flavored--count me in!